What questions do Channel Partners get most often from Customers? Home → Uncategorized → What questions do Channel Partners get most often from Customers? 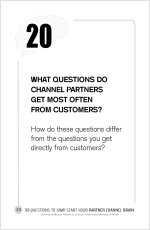 What questions do Channel Partners get most often from Customers? Are they similar to the questions they ask you? Follow me as I blog my way through my book: 99 Questions to Jump Start Your Partner Channel Brain. A few years ago I made the move up to a digital, flat screen television. I did my usual amount of research. You know, Consumer Reports + telephone calls with some buddies who “know” the latest and greatest. My next stop was shopping, beginning with Best Buy, where I could physically compare the units. I was just about ready to go all-in on a unit when my oldest son called the department manager over and asked him a question I hadn’t considered. You see, my son John Jr. worked at Best Buy during his college years and I could tell he had a trick up his sleeve. Matt shook his head, agreeing to help us. In less than five minutes we had our answer and were loading up our cart with a new TV. Can’t get that kind of real-time data on Amazon, can you? One of my first consulting clients was Synergetic Micro Systems. Synergetic was a distributor of networking hardware for industrial Control and Factory Automation. Most of their product line was imported from Europe. Seldom did a day go by that Mike Justice, the CEO and president, wasn’t reminding his staff that they didn’t play favorites with any of the brands or technologies. It was always about selecting the best solution for the customer’s own unique set of challenges, goals, current network topology, future-proofing and pocketbook. To make his point, Mike coined the phrase, “We’re Switzerland. We don’t take sides.” I’m certain I heard him say that a hundred times just at one tradeshow. Since he offered unbiased information (a distinction all too few Channel Partners take advantage of), customers trusted him to provide a fair comparison of the pluses and minuses of competing technologies. When I started my work at Synergetic in 1997, synergetic.com was a pretty basic web site. Mike had posted some brochureware (like we all did in the last century) featuring the complete product line. Analytics back then were basic, raw traffic reports. Nothing close to today’s sophisticated visual reporting and click tracking. At a minimum, though, you could easily determine which pages were getting the most traffic. I remember looking at the reports and scratching my head over one page in particular. This page captured a lion’s share of the traffic. Easily 2X any other page. What made this page such a click-magnet? It was a web page featuring a table (like an Excel spreadsheet) comparing all the commercially available technologies sold by Synergetic. These were the early days of the internet, long before Wikipedia. And the people you would “think” would have a comparison table like ours, namely the trade associations and magazines, were still working on their site designs or warring over domain names. Clearly, Mike had something people wanted and he was the only one who had it. Remember, it’s 1997. The top search engines then were Altavista and Dogpile. Google was just a graduate program research project. Even though our customers were mostly engineers who likely did have access to the web, there wasn’t any guarantee they would find us. Clearly, we couldn’t put all our eggs in an internet-only lead-gen strategy. 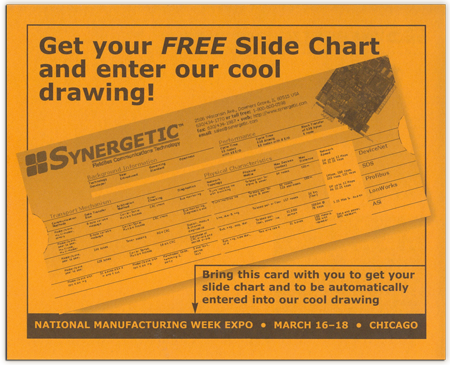 In a few months, Synergetic would be exhibiting at National Manufacturing Week in March of 1998. Mike had secured a primo location in an industry association pavilion which faced the main entrance to the show. In other words, you’d have to be blind to not see our booth. Now, how to entice engineers to come over to our booth? We needed a cool giveaway that only engineers would appreciate. 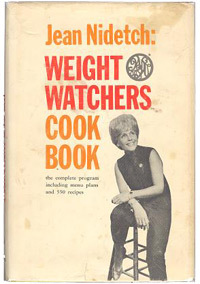 Growing up in the 60’s with parents who seemed to constantly be on a diet (sorry, Mom…), Weight Watchers meetings and Jean Nidetch’s cookbook were just part of everyday life in the Fox family. As a budding geek/engineer—pocket protector and all—I was fascinated with my mom’s calorie counter slide chart, which operated similar to my trusty sliderule. Seemed like you could dial-in most meals and find out what you could eat and in what portions (which was the real problem!). Faced with Synergetic’s need for a tradeshow tchotochke, I knew the web page comparison table had to be turned into a slide chart we could give away at the tradeshow. 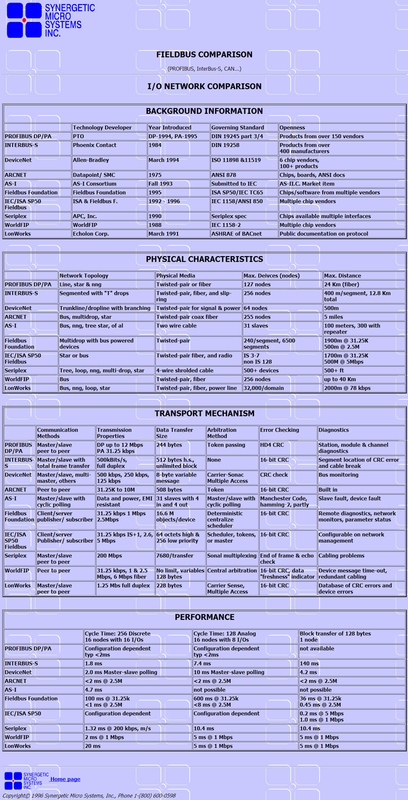 c.1998 Synergetic slide chart comparing fieldbus technologies. Really got our engineer-customers’ beanies spinning! The slide charts were a smashing success. We gave away more than 500 slide charts—in exchange for a business card, of course—during the three-day show. 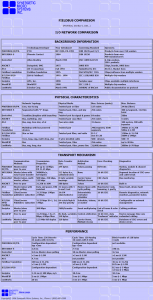 In the following months companies line Amphenol ordered them in bulk as an educational cheat sheet for use in their customer training centers. Not only were they implicitly endorsing Synergetic, they were putting our marketing materials into the hands of future customers…and they paid for them, to boot. Got to love it when customers and market influencers, like Amphenol, pay you for your tchotochkes! It makes sense, doesn’t it? When speaking to a specific vendor, customers ask questions they believe the vendor can and will answer truthfully. These include questions about product specifications, pricing and delivery. Statements that draw comparisons between a vendor’s products and its competitors are immediately handicapped (or dismissed altogether). In my flat screen example, above, how would vendors respond to my question about product returns? Do you believe I’d get the real skinny from a Panasonic or Samsung rep? Doubt it. This puts Channel Partners in quite an enviable position…as long as they have the time and talent to provide the comparison. Often, Channel Partners need assistance understanding subtle product differences between manufacturers, use cases and implications for their customers. This is where vendors can win a lot of brownie points. Educating their Channel Partners on testing techniques and best practices for conducting in-the-field comparisons goes a long way toward building enduring partnerships and ultimately, winning customers. I’m an experienced, revenue-focused, B2B marketing leader especially devoted to the success of the direct and channel sales rep. After all, at the pivotal moment of truth—when reps meet one-on-one with qualified decision-makers—everything the company has put in place to make this meeting happen will be measured.